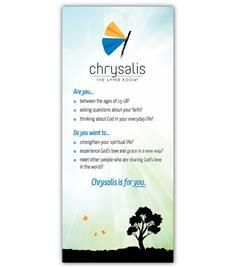 This brochure is the ideal tool for promoting Chrysalis Flights and Journeys. It provides general information about the Chrysalis movement with space for your community toprovide contact information and the dates of upcoming events. Packaged in sets of 50, the brochures are free. You pay only for shipping and handling.